UNFCCC’s COP19 in Warsaw, Poland is the most corrupt climate meeting yet. This is saying a lot. As I recorded when attending COP17 in Durban, previous COPs have see wholesale backtracking from the Kyoto Accord, the only international agreement mandating reductions of greenhouse gas emissions. 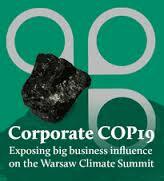 But COP19 sets a new record for corporate influence. Perhaps most egregiously, the Warsaw Climate Summit is scheduled in tandem with the World Coal Association’s Coal and Climate Summit. Coal, of course, is the most polluting form of fossil fuel. All burning of coal should cease immediately if greenhouse gas emissions are to be mitigated. This overlap between the Climate Summit and the Coal Summit is no accident. The confluence was actually organized by the Polish government, which obtains around 80% of its power from coal. In addition, as Pascoe Sabido of the European Corporate Observatory explains in today’s episode of Democracy Now, COP19 was explicitly sponsored by a bevvy of polluting corporate behemoths, from auto manufacturer BMW to Emirates Airlines. These corporate-funded meetings will never be a venue for climate justice. Makes me wanna holler! The 19th session of the conference of parties to the UNFCCC, the primary venue for dealing with climate change on an international level, is about to begin meeting in Warsaw, Poland. As the delegates fly in, it’s worth looking back at the results of the last round of negotiations, in Doha. Is there any chance that COP19 will produce different results? The chance for change seems slight. Instead, we’re likely to see more green washing and more green capitalism.